The world defines us by our name, gender, nationality, race, religion, height, weight, role, job, etc., but these superficial descriptions are not who we truly are. If we look a little deeper we may describe ourselves in terms of our beliefs, thoughts, mood, emotions, desires, interests, etc. But these things are transient – they change, they evolve, they come and go – they are not constant so they cannot be who we truly are. If we look back over our entire life we notice that one thing has remained constant over the years – our sense of awareness. Our awareness is the common factor that links our earliest childhood memories to the present day. Our awareness has experienced every event in our life; in a seamless series of present moments. When we sense deeper into our field of awareness we discover that it has qualities, attributes, characteristics and a sense of identity that goes far deeper than our personality. This is the essence of who we truly are. a) Directly: The Self experiences life directly through its field of awareness (the soul). b) Indirectly: The Self experiences life indirectly by perceiving our personality’s thoughts (mind), emotions (heart) and senses (body). The mind, heart and body (which collectively make up our personality) are not our true Self, but they are aspects of our Being. It has been said that “we are spiritual beings having a human experience”. Our Self is the transpersonal/spiritual element; our mind, heart and body are the personal/human elements; and our field of pure awareness (soul) unites them all into a Human Being. Like the Self, the mind, heart and body are centres of consciousness and fields of consciousness . The human body is also divided into 3 main sections: the Head, the Thorax (chest) and the Abdomen (belly), which are associated with thoughts, emotions and instincts respectively. The Eastern traditions recognise three centres of subtle energy and consciousness which are located in the head (upper tan tien), chest (middle tan tien) and belly (lower tan tien or hara). The Sufi tradition recognises three centres of subtle energy and consciousness which are located in the head (path), chest (oth) and belly (kath). 2. The Heart centre is located in the centre of the chest (behind the centre of the breastbone). It is our primary centre of emotional consciousness and our emotional energy store. It is also known as the “high heart”, the “soul seat” (Barbara Brennan) and the “assemblage point” (Carlos Castaneda). 3. The Body/Belly centre is located in the centre of the abdomen (just below the navel). It is our primary centre of physical consciousness and our body’s vital energy store. Its physical counterpart is the abdominal brain; about 100 million neurons that can function independently of the cranial brain to control some of the body’s basic function. 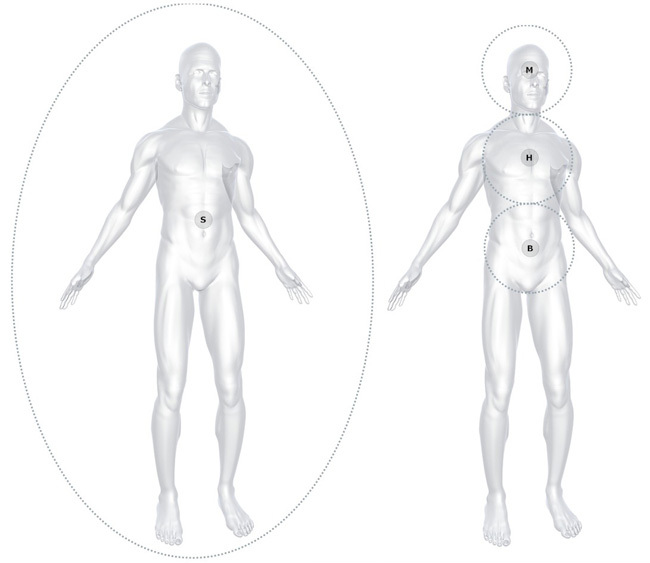 The fields of consciousness surrounding these three centres pervade and surround the entire human body, but the majority of their activity is concentrated in the area surrounding each centre – refer to Figure 2. 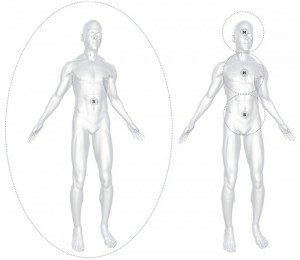 The Self’s primary field of consciousness (the soul or the causal body) pervades the entire physical body and extends about 100cm (40”) beyond, as depicted in Figure 1. The mind’s field of consciousness (the mental body) is concentrated in the head but it pervades the entire physical body and extends about 60-80cm (24-30”) beyond. The heart’s field of consciousness (the emotional body) is concentrated in the chest but it pervades the entire physical body and extends 30-50cm (12-20”) beyond. The body’s field of consciousness (the energy body) is concentrated in the belly but it pervades the entire physical body and extends about 2cm (1”) beyond. The mind, heart and body centres are connected together for seamless integration of consciousness, and the Self can move its awareness around them at will. Collectively these three centres of consciousness constitute the authentic personality. We are not a Self living within a body; we are a body, heart and mind living within a Self/soul. Our body, heart and mind all exist within the field of our Self (soul). Our body, heart and mind only exist for a few decades within the eternal field of our Self (soul). The previous section described who we really are, but that is probably not who we think we are. The “I” that we think we are is probably not who we really are. Unless we are Self-realised or enlightened, we are “asleep” to our true nature – we have forgotten who we truly are. We live from a self-created (false) centre of consciousness which is known as the ego-self. When we were born, our personal consciousness was undeveloped and inexperienced, and we had very little understanding of the world outside of us. As we learnt about the world we gradually constructed a mental model of how we believed things were out there. The more we learnt about the outer-world, the more complex our inner-world model became. Over time, it developed into a meticulously detailed virtual representation of reality. The virtual-reality world inside our mind was a near-perfect representation of the real world, but it was (and still is) coloured by our beliefs and distorted by our misconceptions. Our interactions with other people helped us to fit them into our inner model, and their interactions with us helped us to develop our own concept of self and fit that into our inner model. The concept of self that we developed through our interactions with others was that we are a separate individual contained within a physical body. This was very different to our inherent sense of true-Self, which is pure, radiant, infinite and one-with-everything. So, at this early stage of life we could sense two different selves – our true-Self and our “false” mental concept of self. The two selves were so different that we didn’t know which one to go with – we didn’t know who we were. Our parents related to us as if we were a separate individual in a physical body (our false-self); not as if we were an infinite radiant being (our true-Self). They interacted with our false-self and pretty much ignored our true-Self. Only our false-self got validated, so we eventually went with that one. 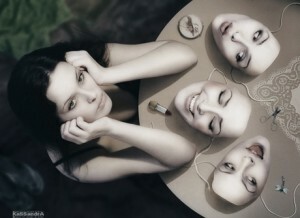 Essentially, the false- self came into being because we were not seen for who we truly are. Our false-self became our identity and our virtual inner-world became our home. Obviously, we can’t live solely in our virtual world because we have to eat, drink and interact with the real world in order to survive. We have to maintain a connection between our virtual inner world and the real world, so we project our virtual world and virtual-self out onto the real world. This gives us the impression that we (false-self) are living in the real world. We perceive the real world with our virtual world seamlessly projected over it. This virtual world overlay is what makes an anorexic person believe they are fat, or a tone-deaf person believe they are a great singer. When our two images of “reality” don’t match up; when our real-world experience clashes with our inner- world expectations, our inner-world and our (false) sense of self are de-stabilised. This makes us anxious, so we feel compelled to reinforce our (false) sense of self and our model of reality by justifying, denying or blaming someone else. Our false-self feels safe and in control in its virtual inner world, but it has very little influence on the real outer-world, so we often get frustrated when things don’t go our way. Our virtual world provides the added benefit of distancing us from the confusing, distressing and traumatic situations of the real world. As a young child we learnt how to use our virtual world as a psychological buffer to soften the impact of real-world distress. It allowed us to block out or distort certain aspects of our reality, paint a rosier picture of our life and justify other people’s negative behaviour towards us. It allowed our innocent and immature personal consciousness to cope with the sometimes harsh realities of the real world. Over time we stopped perceiving the real world directly because it felt safer to perceive life indirectly, through the intermediary of the mind. Over time we became so identified with our false-self and our virtual-world that we fell asleep to objective reality and forgot who we truly are. Soon after we identified with our false concept of self, but before we learnt to use our virtual world as a psychological buffer, something very significant occurred. Next to the creation of the false-self it was probably the most significant event of our life because it fundamentally shaped our self-image, our view of the world and our entire approach to life. This momentous event was our first psychological wound – the first time our newly-created false-self felt hurt. It had a profound effect on us because our false-self had not “solidified” yet, and the primary wound is what solidified it. The primary wound shaped the nature of our false-self by programming it with our primary belief. Our primary belief was our innocent false-self’s response to our primary wound. As a direct result of the primary wound our false-self naively and incorrectly believed that it was inadequate or deficient in some way. The primary belief was “I am not good enough”, or something similar, such as: I am unlovable, helpless, lost, abandoned, insecure, powerless or unworthy. From the perspective of the false-self there is an element of truth in these beliefs because compared to the true-Self the false-self is like a poor black and white photocopy of a scintillatingly beautiful living masterpiece, and deep down we know it. But from the perspective of our true-Self there is zero truth in these beliefs – we are none of these negative things – we are perfect, radiant, complete and limitless. The primary belief that imprinted into our false-self is the seed around which our ego formed. Our entire ego and our general approach to life were heavily influenced by that one false belief. Soothing the feelings of lack associated with our primary belief became our main objective in life. Few of us are aware of this underlying objective that profoundly shapes our approach to life, because it dwells deep within us, at the very core of our being. Most of us avoid going into the depths of our being because we don’t want to stir up our repressed hurts, fears and inadequacies. We generally like to keep our awareness at the periphery of our being, just as we generally like to keep our conversations and relationships on a superficial level where little harm can be done. So what exactly is the ego? The ego is the false-self’s field of consciousness, just as the soul is the true-Self’s primary field of consciousness. The true-Self’s field of consciousness is fluid, dynamic and imbued with an array of essential qualities (which will be discussed shortly), but the false-self’s field of consciousness is rigid and structured, with no inherent qualities. The false-self has to program the ego to tell it what to do and how to behave in each situation. The ego is programmed with our default reactions to life. If we encounter a situation that is similar to one we have previously experienced, we will already have a default pre-programmed response. That program will automatically activate (unless we have the conscious awareness to intervene), causing us to react automatically (without any conscious involvement). This is the first major problem with the ego – it keeps us on autopilot; it keeps us half asleep. The second major problem with the ego is that most of its programs (our beliefs, strategies, thought patterns, emotional reactions and automated behaviours) were initially programmed when we were very young, so many of our reactions to life are immature and inappropriate. Some of our programs were updated and re-written as we became older and more experienced, but the deeper ones were created by and created from very young, naïve, immature and inexperienced consciousness. These old patterns are responsible for most of the unnecessary suffering in our lives, but our fear of venturing into the depths of our being allows our immature core (our inner child) to endure, and our unnecessary suffering to continue. The third major problem with the ego is that it believes we are separate from everyone else and separate from life, rather than an integral part of humanity and an integral part of life. The ego believes we are a separate individual because it is just a thought-form trapped inside our mind and isolated from the rest of the world. The false belief that we are isolated and separate creates fear, which feeds another false belief – that we must protect and defend ourselves psychologically. Many of the ego’s programs are concerned with protecting us, defending our position, and counter-attacking anyone who questions us or our beliefs – which brings us nicely onto point 4. The fourth major problem with the ego is that, deep down it knows it is not real; it knows it was created by the mind; it knows it is just an elaborate thought-form, so it inherently feels unsteady and unsafe. Any confusing, traumatic or distressing experience shakes the ego to its core. It constantly fears for its “life” so it has to develop coping mechanisms, survival strategies and defensive behaviours to strengthen itself and reinforce its position. Lots of physical, emotional and mental energy is consumed in maintaining the ego’s belief structures, coping structures and defensive structures. I call them structures because they are thought-forms that are constructed out of mental “matter”. As the false-self creates new ego structures (beliefs, behaviours, strategies, programs, etc. ), it expands into them, identifies with them and becomes one with them. The false-self expands into the structures to create the ego. We then spend the rest of our lives defending our false-self and reinforcing our ego. These behaviours are the cause of all our unnecessary suffering. Note: Not all behavioural patterns and automated responses are ego structures – many of them are essential to life, allowing us to breathe, move, eat, digest, walk, talk, read and drive without giving them our full conscious attention. These automated patterns start developing as soon as we are capable of learning (i.e. in the womb). But they are not ego structures if we don’t identify with them, take them personally or believe they are us.